Some managers are more likely than others to develop the climate of trust with employees which is needed for them to develop. These managers consider their people to be inherently ambitious, self-motivated and able to exercise self-control. They are also thought to enjoy their mental and physical work. Given the proper conditions, employees will learn to seek out and accept responsibility and to exercise self-direction in accomplishing assigned goals or targets. This approach assumes that most people will want to do well at work and job satisfaction is a strong motivator. So what are the proper conditions? They include creating a trusting and open work environment, listening carefully to employees, communicating openly and showing considerable empathy towards individuals. Communication skills involves clearly and succinctly describing what needs to be done in simple language and in understandable and appealing ways for every individual and the team as a whole. 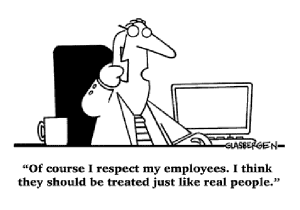 Integrity/ethical behaviour refers to a manager’s relative honesty, integrity and ethical behaviour in performing their work tasks and in dealing with other people. Listening skills refers to a manager’s capacity to both hear and understand other people, and to discover their full communication or message. Motivation and commitment is about how well you find creative ways to challenge people to work in collaborative and committed ways towards a target, and help them to overcome hurdles and break through real or perceived barriers. Trust and openness requires having the faith in individuals that they will try their best and meet their promises (within reasonable limits) and being able to tolerate genuine mistakes so that people can learn. It is also about being open and honest in communicating with people in an honest but considerate way at all times. Warmth and empathy involves creating a positive and supportive work climate and demonstrating an understanding of others’ viewpoints and feelings, especially when important decisions are taken. If any of the issues raised here strike a chord with you, then do give us a call on 01865 881056 or email us at info@leaderslab.co.uk .